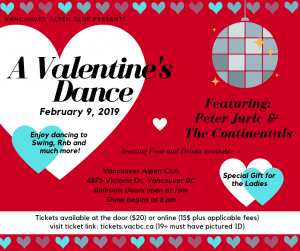 Join the Vancouver Alpen Club for our Valentine’s Dance Party. We celebrate love with a night of dancing, amazing food, drinks and a lot of fun. Don’t miss our famous band ‘Peter Juric & The Continentals’ – well known from our annual Oktoberfest. + 19 only event. The ticket includes a membership for the day. Tickets are non-refundable and non-transferable. You bear all risks of inclement weather.